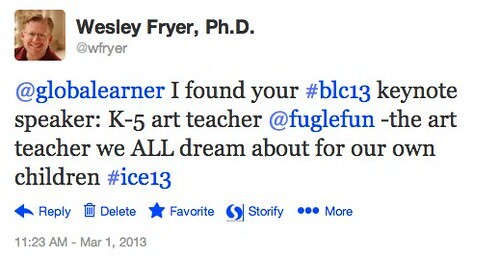 THIS TWEET I SHARED DURING THIS SESSION CONVEYS SOME OF MY ENTHUSIASUM FOR TRICIA AND WHAT AN INCREDIBLE TEACHER SHE IS. WOW. THIS PRESENTATION TOTALLY KNOCKED MY SOCKS OFF! – make Einstein say anything! Not Christina’s World Anymore (iPad lesson) from Tricia Fuglestad on Vimeo. Caricatures Speak Out for Character from Tricia Fuglestad on Vimeo. Careers in Art from Tricia Fuglestad on Vimeo. My 1st Augmented Reality Experience from Tricia Fuglestad on Vimeo. Making an Animated Alien in Doink from Tricia Fuglestad on Vimeo. 5th Grade Rotoscope Animation on iPads from Tricia Fuglestad on Vimeo. – we won $5000 for getting 2nd place in a McGraw Hill contest with the video we made, these were 5th graders who had already graduated, but they came back and celebrated! Use the art of filmmaking to teach anything!